My last run in with Prima Revolving Restaurant was a good 20 years ago! This iconic restaurant is exactly 40 years old, a rarity in today’s competitive food & beverage industry. 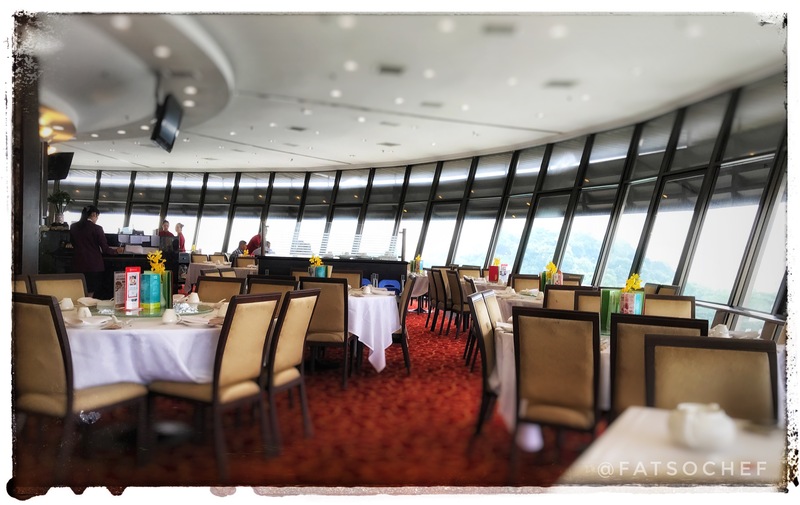 Sitting atop Singapore’s first flour mill and currently the only revolving restaurant, Prima promises a 360 degree panoramic view of Singapore’s business district including our massive shipyard. A sense of nostalgia filled me the moment we drove through the industrial gates of the mill. Take the elevator to the ninth floor and be greeted by a long escalator followed by another flight of spiral steps up the restaurant. Subtle signs of the 70s were reflected in the maroon patterned carpet and the dated chandelier in the lobby. The rest of the ambience is neither aged nor crummy. They have definitely made efforts to modernize the restaurant while preserving some old school grandeur. The semi circular stage in the center is still present. A popular wedding venue in the 80s, that’s where the bridal couple would sit while their guests revolve around them! Ah… the old days!! Our decision to check out Prima was totally impromptu. Though the restaurant specializes in Beijing cuisine, a quick dim sum lunch was what we had in mind. The dim sum menu was an array of the standard fare. We ordered some personal favorites plus a couple of recommendations which mostly did not disappoint. Steamed Rice Roll with Prawn – The rice roll was soft and thin while the prawns were fresh, firm and juicy. The savory sauce was spot on! Steamed Chicken Feet in Black Pepper – These were really delicious… and not too spicy despite the the red chillis. Instead, strong flavors of garlic, fermented black beans and black pepper deeply penetrated the meat. And the best part was how plump the feet were! Definitely a must order! Pan Fried Chive Dumpling – A translucent skin with a soft chew and a nutty fragrance from the roasted sesame seeds. The filling was a juicy combination of chives, mushrooms and minced meat. Way better than I had expected. Steamed Shanghai Dumplings (Xiao Long Bao) – The skin was a little thick but the filling was not without the mandatory tasty broth. The meat was well seasoned and juicy. Steamed Shark’s Fin & Snow Crab Stick Dumpling – These fat dumplings were tightly packed with a mix of seafood and little shreds of shark’s fins. Despite the lack of shark’s fins, they were hearty and flavorful and surely worth a try. Pan Fried Radish Cake- The only disappointment for me…. But perhaps not for those of you who like it dense and firm. I do like that they were given a proper sear! Those crispy edges were very enjoyable! Melon and Sago in Coconut Milk – This was nothing to scream about except for the portion! It definitely needs up-sizing! The small sundae cup (evidently from the 70s) barely held a cupful of the dessert. There were 3 bland melon balls swimming in a bland coconut and sago pearl concoction. That’s a teaspoon in the picture so you could visualize the size of the bowl! From left: The entrance that seemed unchanged from 1977; the mandatory aquarium that depicts class in the 70s; and the long escalator that takes you not to the restaurant but to another flight of steps up to the restaurant! From left: The dumpling that’s generously packed; the Xiao Long Bao wrapper stood the test of the chopstick pinch without breaking; the super plump chicken feet was a winner; and the unique and delicious chive filling encased in a chewy shell. A restaurant that can proudly claim they stood the test of time. I wouldn’t hesitate another go at their dim sum if I’m ever in the neighborhood. I’d definitely take friends who have not experienced dining in circles! And having lived in Beijing for many years, I would be most excited to check out their specialized Beijing cuisine if just to compare authenticity or simply jolt some happy memories again! Disclaimer – This is not a sponsored post. Previous INDOCHINE… STILL GOOD AFTER ALL THESE YEARS!